Credit: 307891Tom Pennington/Getty Images for Texas Motor Speedway. Erik Jones, driver of the #20 GameStop/Mortal Kombat X Toyota, celebrates by saluting the crowd after a burnout after winning the NASCAR XFINITY Series O’Reilly Auto Parts 300 at Texas Motor Speedway on April 10, 2015 in Fort Worth, Texas. 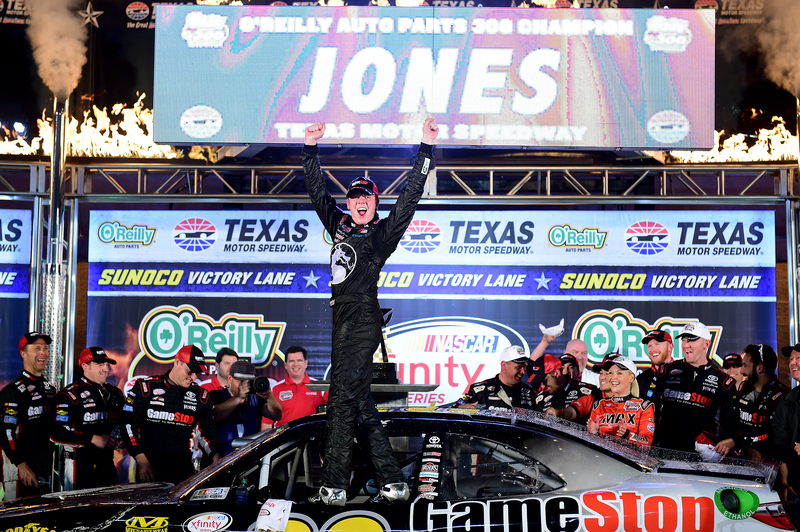 Starting from pole Car 20 Erik Jones GameStop/Mortal Kombat X Toyota won the 19th Annual O’Reilly Auto Parts 300, his 1st win in 9 NASCAR XFINITY Series races. 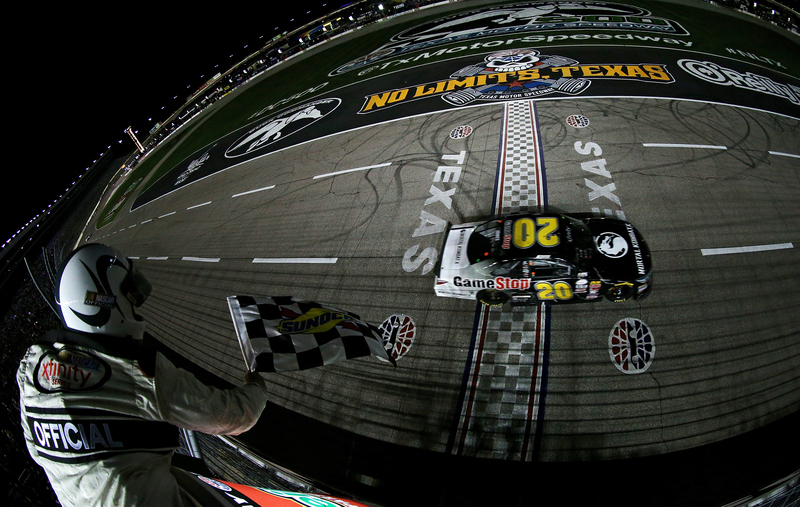 At 18 years, 10 months, 11 days, Jones is the 2nd youngest winner at Texas (Chase Elliott). A NASCAR Next graduate, this is Jones’ 5th NASCAR national series win. He also has four wins in the NASCAR Camping World Truck Series. 2nd Place Car 22 Brad Keselowski Discount Tire Ford starting from tail posted his 11th top-10 finish in 15 races at Texas Motor Speedway. It is his 3rd Top 10 finish in 2015. 3rd Place Car 88 Dale Earnhardt Jr. Goody’s Chevrolet starting from 5th place posted his 6th Top 10 finish in 8 races at Texas Motor Speedway. Credit: 307892Sean Gardner/NASCAR via Getty Images. Erik Jones, driver of the #20 GameStop/Mortal Kombat X Toyota, takes the checkered flag to win the NASCAR XFINITY Series O’Reilly Auto Parts 300 at Texas Motor Speedway on April 10, 2015 in Fort Worth, Texas. 4th Place Car 7 Regan Smith TaxSlayer.com Chevrolet starting from 6th place followed by 5th place Car 33 Austin Dillon Ruud Chevrolet starting from 3rd place. 6th Place Car 6 Darrell Wallace Jr. AdvoCare Ford starting from 8th place was the highest finishing rookie. 7th Place Car 54 Denny Hamlin Monster Energy Toyota starting from 11th place followed by 8th place Car 9 Chase Elliott NAPA Auto Parts Chevrolet starting from 9th place. 9th Place Car 60 Chris Buescher Safety-Kleen Ford starting from 10th place. Lastly in the Top 10 was Car 2 Brian Scott Albertsons/Reser’s Chevrolet in 10th place, starting from 7th place. 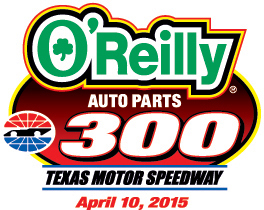 Ty Dillon leads the point standings by 2 points over Chris Buescher. Credit: 307882Sean Gardner/NASCAR via Getty Images. Erik Jones, driver of the #20 GameStop/Mortal Kombat X Toyota, and Daniel Suarez, driver of the #18 ARRIS Toyota, lead the field to the green flag for the running of the NASCAR XFINITY Series O’Reilly Auto Parts 300 at Texas Motor Speedway on April 10, 2015 in Fort Worth, Texas. The race had 6 Cautions for 30 Laps: 1st Caution on lap 3 for Fluid on the track. 2nd Caution on lap 18 for Car 52 Joey Gase DB Sales Company Chevrolet spin in turn 1. 3rd Caution on lap 65 for Debris in turn 3. 4th Caution on lap 80 for Car 24 Eric McClure Hefty Easy Grip Cups Toyota crash in turn 4. 5th Caution on lap 129 for Debris on the frontstretch. 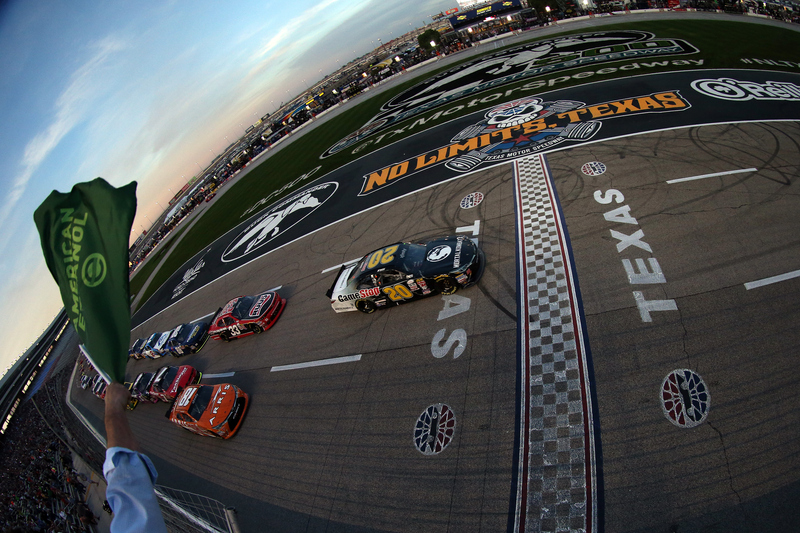 6th Caution on lap 169 for Car 14 Cale Conley # IAVA Toyota, Car 62 Brendan Gaughan WIX Filters Chevrolet crash in turn 2.
Credit: 307890Robert Laberge/Getty Images for Texas Motor Speedway. 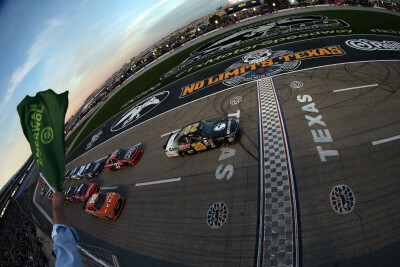 A general view of cars racing the NASCAR XFINITY Series O’Reilly Auto Parts 300 at Texas Motor Speedway on April 10, 2015 in Fort Worth, Texas. The race had action with 15 Lead Changes among 8 drivers: E. Jones(i) 1-4; D. Earnhardt Jr.(i) 5-13; E. Jones(i) 14; D. Earnhardt Jr.(i) 15-17; E. Jones(i) 18; B. Gaughan 19-21; B. Scott 22-47; B. Keselowski(i) 48-65; E. Jones(i) 66-82; B. Keselowski(i) 83-120; D. Wallace Jr. # 121-123; D. Armstrong 124-130; A. Dillon(i) 131; E. Jones(i) 132-137; D. Earnhardt Jr.(i) 138-150; E. Jones(i) 151-200.
Credit: 307889Jared C. Tilton/NASCAR via Getty Images. 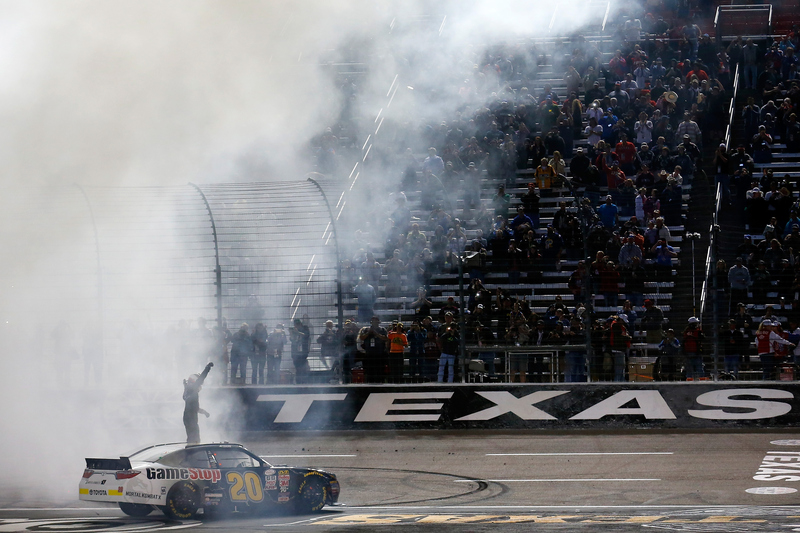 Erik Jones, driver of the #20 GameStop/Mortal Kombat X Toyota, celebrates in victory lane after winning the NASCAR XFINITY Series O’Reilly Auto Parts 300 at Texas Motor Speedway on April 10, 2015 in Fort Worth, Texas. 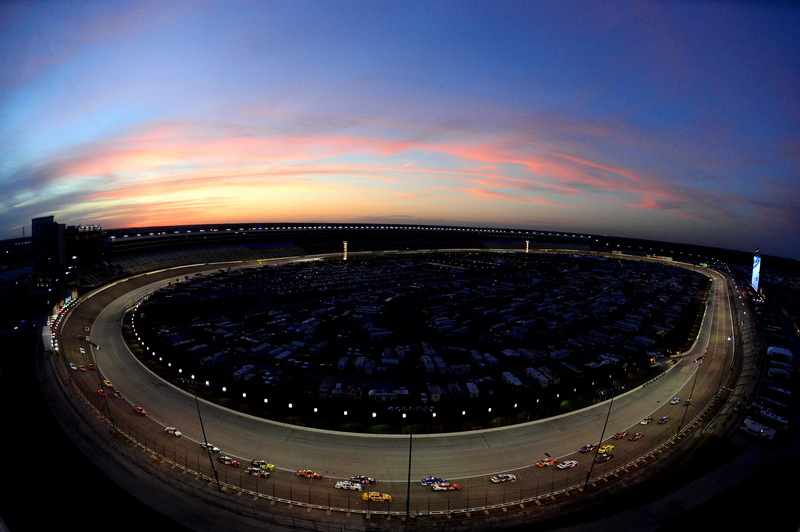 Credit: 307877Sean Gardner/NASCAR via Getty Images. 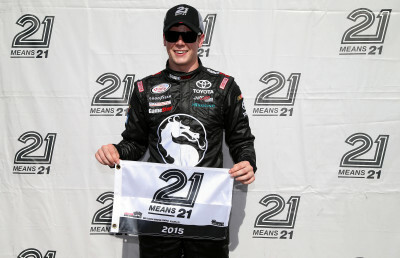 Erik Jones, driver of the #20 GameStop/Mortal Kombat X Toyota, poses with the 21 Means 21 Pole Award after qualifying for the pole for the NASCAR XFINITY Series O’Reilly Auto Parts 300 at Texas Motor Speedway on April 10, 2015 in Fort Worth, Texas. This was also a great effort by Brad Keselowski, who won a 2nd place start from qualifying, but started tail due to unapproved changes to the car. Jeff Gordon who was a guest commentator, stated it will be exciting to watch Keselowski work his way through the field. Top 10 Driver Points: (1) T. Dillon 219;(2) C. Buescher 217;(3) C. Elliott 208;(4) D. Wallace Jr. # 204;(5) R. Reed 197;(6) R. Smith 197;(7) E. Sadler 181;(8) B. Gaughan 176;(9) B. Scott 169;(10) D. Suarez # 160.